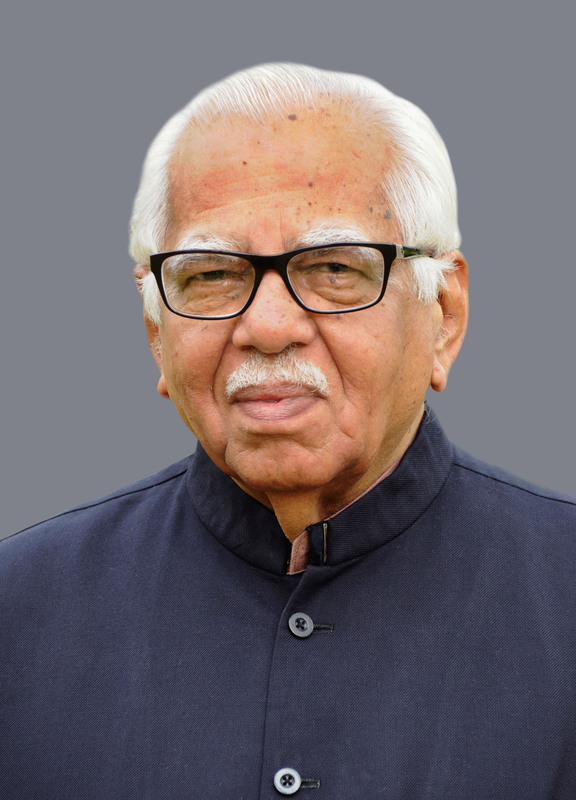 Shri Ram Naik took Charge as Governor of Uttar Pradesh on 22nd July 2014. (1) Shri Ram Naik was designated as the Governor of Uttar Pradesh by Hon’ble President of India on 14th July 2014 and took the oath of office on 22nd July, 2014 at Lucknow, the capital of Uttar Pradesh. Subsequently he was also designated as the Governor of Rajasthan on 5th August, 2014 and held the additional charge for Governor of Rajasthan from 8th Aug. 2014 to 3rd Sept. 2014. Shri Naik was felicited with ‘National Eminence Award’ in Mumbai on 13th December, 2014 by Pujyasri Jayendra Saraswati Swamigal of His Holiness Jagadguru Sankaracharya of Kanchi Kamakoti Peetham.The previous awardees included former Prime Minister Bharat Ratna Shri Atal Bihari Vajpayee, former Presidents late Dr. Shankar Dayal Sharma and Dr. A.P.J. Abdul Kalam, etc. (2) Shri Naik was the Cabinet Minister of Petroleum & Natural Gas in the Government led by Shri Atal Bihari Vajpayee from 13th October 1999 to 13th May 2004. After creation of a separate Ministry for Petroleum & Natural Gas in 1963, he has a rare distinction to be the only Petroleum Minister to head the ministry for full five years. In the earlier Cabinet, he was Minister of State for Railways (Independent Charge), Home Affairs, Planning & Programme Implementation and Parliamentary Affairs (from 13th March 1998 to 13th October 1999), a record number of Ministries indeed at one time! He was a member of Bhartiya Janta Party (BJP) National Executive Committee and also the National Convener of ‘Good Governance Cell’ specially constituted to enhance efficiency and performance of Ministers in BJP ruled states. Shri Naik decided that he would not contest 2014 Lok Sabha election and would continue to work for BJP sharing his political experience. The decision was announced in a press conference held on 25th September 2013, the birth anniversary day of Pandit Deendayal Upadhyay who led the Bharatiya Jana Sangh (BJS) by his characteristic simplicity and expounded the theory of Integral Humanism. In 2014 Lok Sabha elections, BJP candidate Shri Gopal Shetty nominated from his North Mumbai constituency secured highest votes 6,64,004 and also the highest margin of 4,46,582 in Maharashtra. Shri Naik was his Election – in – charge. (3) When Shri Naik took over as a Minister of Petroleum & Natural Gas in October 1999, the waiting list of LPG for domestic cooking purposes was 1 crore 10 lakh. During his tenure he not only liquidated the waiting list but also gave 3 crore 50 lakh new connections against 3 crore 37 lakh connections in previous 40 years. He also introduced 5 kg cylinders to cater to the needs of families in lower income group in hilly regions as well as urban slums. The LPG cylinders were available on demand. He planned many programmes to overcome 70% dependence on import of crude oil and also started their implementation. Important among them was production of ethanol as a by-product in sugar factories, which would be blended upto 10% with petrol to be used as transport fuel. The Petroleum Ministry also allotted Petrol Pumps and LPG Distributorships to widows/dependents of Defence Personnel who laid down their lives in Kargil war. Brave women and men of those security personnel who lost their lives in protecting Parliament House from attack by terrorists in December 2001 were also awarded Petrol Pumps for their supreme sacrifice. In order to reduce pollution by vehicles run on petrol-diesel, he introduced CNG in Delhi and Mumbai. At present 1.40 lakh autorikshaw, 53 thousand taxies, 7,500 private cars and 8,400 buses-trucks-tempoes run on CNG in Mumbai. Instead of LPG cylinders for cooking, he introduced more safe, easy to use and also comparatively cheaper pipe gas for cooking. Presently 7 lakh families in Mumbai and 1,900 small industries are using PNG in Mumbai. (4) Shri Ram Naik is known as a friend of Mumbai suburban railway commuters. He started organising suburban commuters by founding ‘Goregaon Pravasi Sangh’ in 1964. A commuter activist turned into Minister of State for Railways in 1998, he got established the Mumbai Rail Vikas Corporation (MRVC) for providing better facilities to 76 lakh commuters who travel in the world’s most over-crowded suburban trains in Mumbai. He was instrumental in starting ‘Special Ladies Local Trains’ in Mumbai for the first time in the world. Extension of suburban section of Western Railway upto Dahanu, 12 coach rakes, computerized reservation centres at various places, quadruplicating of railway lines from Borivli to Virar and 6 tracks of railway lines from Kurla to Kalyan are a few of the important works in the city for which Shri Naik was instrumental. The dynamic decision of banning sale of cigarettes and bidies on railway platforms and trains was taken during the regime of Shri Naik. The innovative idea of inviting commuters’ suggestions for naming new trains is a brain-child of Shri Naik. He was also instrumental in providing relief to commuters affected in bomb-blasts of suburban trains on 11th July 2006. Dahanu-Churchgate locals have been commissioned from 16th April 2013, thereby increasing the distance of suburban section from 60 Kms. to 124 Kms. on Western Railway. (5) Shri Ram Naik who represented North Mumbai Lok Sabha Constituency from Maharashtra as a BJP MP has a track record of getting elected successively for five terms. Earlier he got elected as an MLA for three consecutive terms from Borivli Assembly Constituency, which is a part of his Parliamentary Constituency. In the elections for the 13th Lok Sabha, he secured 5,17,941 votes, which were the highest votes secured by an M.P. in Maharashtra. He created a new record of getting elected successively eight times from Mumbai. He used to present his annual Performance Report to the voters as people’s representative to uphold the democratic principle of accountability. Even after becoming Governor, he has presented the report of his first year 2014-15 under the caption ‘Ram Naik in Raj Bhavan’ on 22nd July, 2015. This again is the first such report to be released by any Governor in the country. (6) Shri Ram Naik, a seasoned Parliamentarian was the Chairman of the prestigious Public Accounts Committee in 1995-96. He was the Chief Whip of BJP in the 11th Lok Sabha. He also contributed significantly in the Parliamentary debates as well as in important committees like Joint Parliamentary Committees for Security Scam and Empowerment of Women, Railway Convention Committee, etc. He was also a member of the Chairman’s Panel to preside over the Lok Sabha proceedings. (7) Shri Naik has been instrumental in singing ‘Vande Mataram’ and ‘Jana Gana Mana’ in the Parliament. He successfully prevailed upon the Government to change the name ‘Bombay’ in English and ‘Bambai’ in Hindi to its original Marathi name ‘Mumbai’. Thereafter many cities were changed to their original local names Madras to Chennai, Calcutta to Kolkata, Bangalare to Bengaluru Trivandrum to Tiruanantpuram etc. It is his brain-child, which made available Rs.1 crore annually to each Member of Parliament for need based small development projects in his constituency. This amount was increased to Rs. 2 crore during his tenure as Minister of State for Planning & Programme Implementation. It has been subsequently increased to Rs. 5 crore. He also introduced, in the capacity of a Private Member, a Bill for ‘Promotion of Breast Feeding and Ban on Advertisements of Baby Foods’. The Bill was subsequently adopted by the Government and became an Act, the only bill to get this honour in the Indian Parliamentary history. (8) Born on 16th April 1934, at Sangli in Maharashtra, Shri Ram Naik had his early school education at Atpadi in Sangli District and secured B.Com. degree in 1954 from Brihan Maharashtra College of Commerce, Pune and LL.B. degree in 1958 from Kishinchand Chellaram College, Mumbai. He started his career in the Accountant General’s Office, Mumbai as an Upper Division Clerk. In due course he rose to higher posts and also worked as a Company Secretary and Management Consultant till 1969. He has been a R.S.S. Swayamsevak from his childhood. (9) On the organizational wing of the political party, he started as a grass-root worker of the erstwhile BJS. In 1969, he resigned from the service to work as the Organising Secretary of Mumbai unit of BJS. He continued to work in that capacity for eight years. He was also President of BJP Mumbai unit for three terms. He was a Special Invitee of National Executive Committee and also the National Convener of ‘Good Governance Cell’, till he resigned from the BJP after nomination as the Governor of U.P. (10) Shri Naik has personally pleaded for rehabilitation of project affected persons of the country’s first Tarapur Atomic Power Project III and IV in Mumbai High Court from 2004. The long awaited justice is on way. Shri Naik has also written a book ‘Saga of Struggle’ which narrates the case history. The book is translated version of his original Marathi book ‘Gatha Sangharshachi’. With Shri Naik’s initiative, a petition was submitted to the Rajya Sabha on 5th December 2007 for empowerment and rehabilitation of the leprosy affected families. The Committee on Petitions have submitted their report to the Rajya Sabha on 24th October 2008. He was also the President of the International Leprosy Union, Pune from 23rd November 2012 till his nomination as the Governor. The NGO was founded in 1987 by the renowned sociologist Dr.S.D.Gokhale . Shri Naik also penned his memoirs in the widely circulated Marathi Daily ‘Sakal’. These were published in Book form under the title ‘Charaiveti! Charaiveti’ (Marching Ahead) on 15th April, 2016. It has been subsequently translated in English, Hindi, Gujarathi and Urdu languages. (11) Shri Naik, a winner of successive eight elections, has also won over the serious disease of Cancer in 1994. He has devoted full time for the Party and also the social work stating that in recovery from Cancer, he got the ‘bonus’ of his life and that he would utilize it in the Service of the Nation. Shri Naik is a unique personality, known for his awareness and his eye for the details. He is respected for his honesty, transperency, wide networking and public contact, as also for his remarkable competence. He is workholic and enjoys work at the age of 82.